Declarative and Procedural Knowledge checklists – articulate clear learning goals | What did you learn at school? The first step to a good formative assessment strategy is articulating clear learning goals. One effective way to do this is to use a Declarative and Procedural Knowledge Checklist. Cognitive psychologists classify knowledge into two categories: declarative knowledge (which the learner knows or understands) and procedural knowledge (which the learner is able to do). In other words, declarative knowledge is about information; procedural knowledge is about skills. It is important that educators understand the distinction between these two types of knowledge because both are important. While the end goal of learning often involves students’ ability to do something (for example, write an essay), students must have knowledge of the underlying concepts in order to succeed (Marzano et al, 1997). Ideally, the Checklist would be provided at the beginning of a unit of work as an advance organiser and then revisited at regular intervals so students can track their progress in acquiring these two types of knowledge. 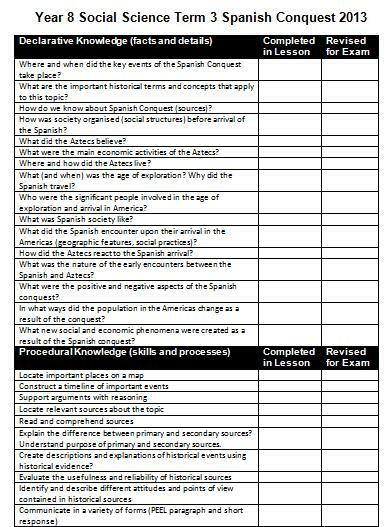 Set out below is a checklist I used for a Year 8 History unit on Spanish Conquest this year. Your example from the Year 8 unit provides a wonderful example of the type of scaffolding that you are describing. Thank you for sharing this resource.